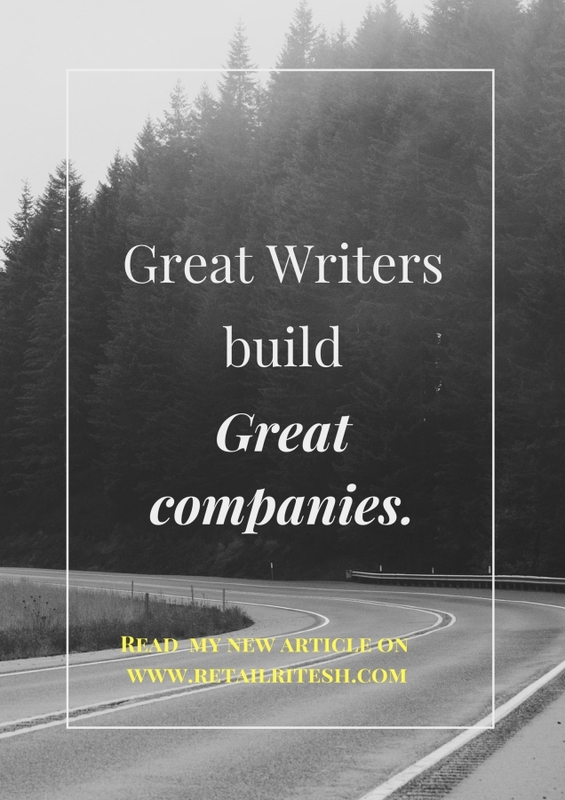 19 Aug Great writers build Great companies!!! Last week I attended a retail industry social networking event, wherein I met with very interesting people from retail fraternity and I happened to participate in one discussion with a couple of senior industry stalwarts over cocktails on the role of HR and current hiring trends. This discussion was so insightful & inspired me to pen down my views on current hiring trends which might be helpful for some professionals seeking better opportunities. We all know that resumes are redundant. They are full of “action verbs” that don’t mean anything. The ideal way is to check the candidate’s cover letter. This is where you get to see clear communication instead of a list of skills, verbs and years of experience. You hear someone’s actual voice in a cover letter. Over 80% of CEOs in the top 500 US companies did not receive their graduate degrees from Ivy League colleges. Instead, they have made their way upwards by constantly upgrading their knowledge and by continuous learning. Mark Twain once quipped, “I have never let my schooling interfere with my education”. This quote is so relevant in current times. The third point is very close to my heart and I always propagate the same to my fellow teammates and actually practice it myself (I always conduct role play session with the candidate during interview session or give an assignment on some topic prior to interview session). The point I am trying to make here is that HIRE CANDIDATES WHO ARE GREAT WRITERS. Clear writing is a sign of clear thinking. Writing gives a direction to mind & prove to be useful in project planning, strategic thinking, strategy development and building brands. They can put themselves in someone’s shoes very easily. (Empathy is very crucial for the managers who manages their team members). Writing makes your thought process crystal clear (very important when you are working on strategic goals). Good writers know what to omit (Any information which does not contribute to main communication objectives needs to be omitted that’s the main role of a good leader. I would end this article with a statement that I firmly believe i.e. “Writing is the new currency for Ideas”. Ritesh Mohan is a passionate retail professional with over 20 years in the Retail sector, handling some of the biggest brands in beauty, fashion and fragrances retail & FMCG sector. He has been instrumental in the growth of some of the regional brands as well in the Middle East region. He specializes in Retail management, Product development and Brand management, Retail Operations, Sales Management and Franchising & Business Management. He strongly believes in empowering business owners with his wisdom & experience of around two decades in the industry.